MultiVOIP is ideal for multi-location businesses looking to reduce toll charges between frequently called sites. MultiVOIP is a voice over IP gateway that integrates seamlessly into your data network and operates alongside existing PBXs, or other phone equipment to simply extend voice capabilities to remote locations. It is designed to help you maximize investments you’ve already made in your data and voice network infrastructure. 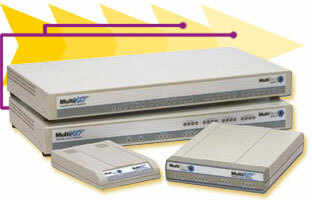 A MultiVOIP network can be as small as two offices or as large as hundreds of offices. Each office installs and configures a MultiVOIP on their network and connects it to their existing phone equipment to begin placing calls, sending faxes, or making modem connections to the other offices on the VOIP network. Telecommuters or customers off the IP network can make free long distance calls by dialing into a local MultiVOIP and placing toll-free calls to any location on the VOIP network. You can even have a MultiVOIP at a remote site dial a local phone number for a free person-to-person long distance call. Extend the reach of your PBX into home office locations. Simply connect a MultiVOIP gateway to the PBX at the corporate office, and another MultiVOIP gateway at the remote office. Now, anyone can place calls to the remote office by simply dialing an extension number. To extend your PBX to a building across the street, utilize a wireless bridge to connect the two networks. Now, you have voice and data connectivity without having to lay cables or paying monthly charges for dedicated lines. A corporation that utilizes tie lines to connect branch office PBXs to the corporate PBX can now use the company’s IP-based Wide Area Network to complete the call. MultiVOIP can save your company substantial amounts in long distance charges. Even if your company uses one of the most inexpensive calling plans, a MultiVOIP network can quickly return your investment and begin paying you back. With MultiVOIP, you’ll experience consistent toll-quality voice connections. Using the Perceptual Speech Quality Measurement (PSQM), Internet Telephony magazine found that MultiVOIP delivered exceptional voice quality. In fact, MultiVOIP outranked the competition.